Tinea versicolor is a skin condition caused by the overabundance of yeast or fungi in the body. A February 2006 “Journal of Allergy and Clinical Immunology” article notes that the yeast that leads to the tinea versicolor skin condition are caused by the Malassezia mold species. Although noted to be a regular resident of the skin, situations that lead to its increased growth cause the spotty pigment changes characteristic of the condition. Foods that are moldy in character or provide a substrate for yeast growth can negatively affect this condition. Sugar is abundant in many food sources. It can exist in both simple and complex forms in the carbohydrates consumed in the diet. Simple forms of sugar have less fiber and protein and are easily transformed into immediate sugar that can fuel a yeast or mold overgrowth. In the four phase Yeast-Fighting diet associated with the bestseller book, “The Yeast Connection,” sugar is noted as one of the first types of foods that must be eliminated in order to effectively fight this organism. The easiest types of sugars to eliminate are the ones that are added to foods and beverages, such as sugar in coffee, honey in teas, and sugar sprinkled on oatmeal or fresh berries. Baked goods are foods that often require the use of a baker’s yeast to cause the dough to rise. These products are not only made from ground grains, which are a type of carbohydrate, but additionally have the added effect of being infused with a known yeast product in order to support or expedite its production response. 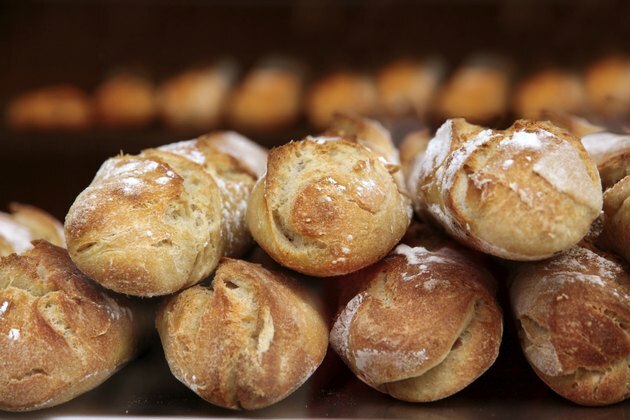 The Yeast-Fighting diet suggests that baked goods that use wheat and yeast be eliminated during phase three, also known as the reassessment phase. The book “Biological Treatments for Autism and PDD” by Dr. William Shaw notes that a non-yeast bread be used as a substitute. Vinegar is a common ingredient in many condiments including salad dressings, ketchup and mayonnaise. Shaw notes it to be formed from very old wine, and he notes that it is very concentrated in yeast-like byproducts and toxins. Shaw describes barley malt as a byproduct of the beer-making process, and it is found as a pervasive ingredient in commonly eaten foods like crackers, cereals, breads and other grain-based breakfast foods. Like vinegar, Shaw suggests that barley malt be eliminated from the diet due to its ability to support yeast overgrowth. Nuts, especially peanuts, are known to grow mold spores, some of which can be toxic. Both Shaw and the Yeast-Fighting diet recommend nuts be eliminated from the diet. Shaw notes that some nuts like hazelnuts and macadamia nuts are a little better tolerated and may be eaten periodically. Fruit is a source of natural sugar known as fructose. Although fruits offer many nutritional benefits, Shaw says that even the natural sugars found in fruit can accelerate yeast growth and should be eliminated for at least one month. Alcohol is concentrated source of carbohydrates. It is also very calorie-dense. Many alcohols undergo a fermentation process through the use of yeasts. Shaw notes that strains of yeast from the family of Saccharomyces cerevisiae are used in the brewing of alcohol and are similar to other yeasts, like Candida, that can lead to diseases of yeast overgrowth. What Foods Can Cause a Yeast Infection?